Hello and welcome to the 427th installment of the SWD. Improvised explosive device wounded a police officer in Urum al-Kubra village, west of Aleppo. Unknown gunmen killed two Uzbek fighters on the road between Haranbush and Maarat Misreen. Reports suggest that the killed fighters belonged to the Turkistan Islamic Party. Syrian Arab Army destroyed a vehicle of the Free Syrian Army’s Jaysh al-Izza with an anti-tank guided missile at the outskirts of Al-Lataminah. Four elements of Jaysh al-Izza were killed and two wounded in the encounter. Improvised explosive device targeted a group of Syrian Arab Army’s elements near a national hospital in the southern part of Taldou city. The explosion reportedly killed five and wounded seven elements of the Syrian Arab Army’s 67th Armored Brigade. 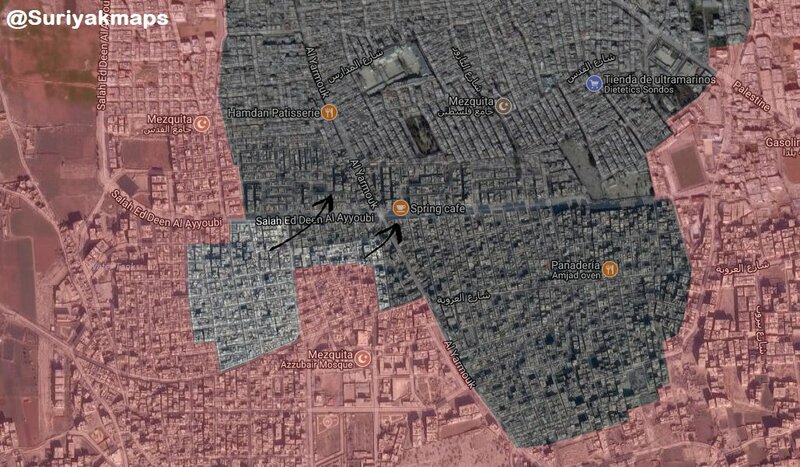 Syrian Arab Army and allies made additional advances against the Islamic State in Al-Hajar al-Aswad, and are now reportedly almost in full control of the locality. However, Islamic State’s Amaq Agency stated that 36 elements of the Syrian Arab Army were killed in clashes with the group in Al-Hajar al-Aswad. The agency also stated that the Islamic State launched a counterattack against the Syrian Arab Army and allies in southern Damascus. Islamic Emirate of Afghanistan (Taliban) overran two Afghan National Army’s checkpoints in Sheikha area of Dawlat Abad district. Similarly, the Islamic Emirate of Afghanistan captured an Afghan National Army’s post in Gandab area of Chilgazy district. One element of the Afghan National Army was killed and three wounded, while three elements of the Islamic Emirate of Afghanistan were wounded in the encounter. Islamic Emirate of Afghanistan seized an assault rifle and a PK machine gun from the post. Islamic Emirate of Afghanistan overran and destroyed an Afghan National Police’s post in Qarqin district. Five elements of the Afghan National Police were killed in the encounter. Islamic Emirate of Afghanistan seized two assault rifles from the post. Two elements of the Afghan Local Police surrendered to the Islamic Emirate of Afghanistan with their weapons in Chimtal district. Afghan National Security Forces started clearing operations in Tala wa Barfak district against the Islamic Emirate of Afghanistan. Afghan National Security Forces killed 11 elements of the Islamic Emirate of Afghanistan, as well as destroyed five fighting positions and seized several weapons depots and ammunition caches in the district. Afghan National Security Forces killed two elements of the Islamic State and destroyed two weapons depots in Deh Bala (Haska Meyna) district. Islamic Emirate of Afghanistan attacked the Afghan National Police’s headquarters and the administrative building of Ghani Khel district. Four elements of the Afghan National Army were killed and three wounded in the encounter. Three elements of the Afghan National Army surrendered to the Islamic Emirate of Afghanistan with their weapons in Chaparhar district. Islamic Emirate of Afghanistan overran an Afghan Local Police’s post in Sayid Karam district. Four elements of the Afghan Local Police were killed and one wounded in the encounter. Two elements of the Afghan Local Police surrendered to the Islamic Emirate of Afghanistan in Dara Boom district, handing over two assault rifles and a motorcycle to the group. Islamic Emirate of Afghanistan killed two and wounded eight elements of the Afghan National Army, as well as destroyed an armored vehicle in Adraskan district. One element of the Islamic Emirate of Afghanistan was killed and two wounded in the encounter. Islamic Emirate of Afghanistan’s improvised explosive device destroyed an Afghan National Army’s armored vehicle, killing three and wounding soldier in Zarha Bazar area of Kushki Kuhna district. Islamic Emirate of Afghanistan’s Al-Emarah News stated that the group captured Chaghto district from the Afghan National Security Forces, after capturing the Afghan National Police’s headquarters and all of the checkpoints in the district. Islamic Emirate of Afghanistan overran five Afghan National Army’s posts in the city of Ghazni. Islamic Emirate of Afghanistan’s Al-Emarah News stated that 16 elements of the Afghan National Army were killed and 11 wounded, as well as four armored vehicles destroyed in the encounters. Islamic Emirate of Afghanistan overran two Afghan National Army’s posts in Gelan district, killing seven and wounding five soldiers in the process. Similarly, the Islamic Emirate of Afghanistan overran an Afghan National Police’s post in Andar district, reportedly killing six policemen. Afghan National Security Forces killed two elements of the Islamic Emirate of Afghanistan and destroyed three vehicles in Bala Buluk district. Islamic Emirate of Afghanistan launched another attack on the city of Farah against the Afghan National Security Forces. Clashes between the two sides still continue, without any information about casualties on either side. Afghan National Security Forces killed 18 and wounded three elements of the Islamic Emirate of Afghanistan, as well as destroyed two bases and several weapons depots and ammunition caches in Khas Urozgan district, according to the Afghan Ministry of Defense. Islamic Emirate of Afghanistan launched a large attack against the Afghan National Security Forces in Khas Urozgan district, reportedly capturing three checkpoints, while clashes are still ongoing around the Afghan National Police’s and National Directorate of Security’s headquarters. Islamic Emirate of Afghanistan overran two Afghan National Army’s checkpoints in Tori Chinie area of Chora district. Afghan National Security Forces killed one and wounded two elements of the Islamic Emirate of Afghanistan in Mizan district. Islamic Emirate of Afghanistan killed four and wounded two elements of the Afghan National Army in Mizan district. Islamic Emirate of Afghanistan overran an Afghan National Army’s checkpoint in Haji Matea Killi area of Arghandab district. Islamic Emirate of Afghanistan’s Al-Emarah News stated that 19 elements of the Afghan National Army were killed and seven wounded in the encounter. Islamic Emirate of Afghanistan seized two assault rifles, two PK machine guns, and an RPG launcher from the checkpoint. Islamic Emirate of Afghanistan attacked an Afghan National Army’s checkpoint in Kierati area of Kang district. Afghan National Army’s commander, Faiz Muhammad was killed and another element of the army wounded in the encounter. Afghan National Security Forces killed six and wounded 11 elements of the Islamic Emirate of Afghanistan in Kajaki district. Islamic Emirate of Afghanistan attacked an Afghan National Army’s foot patrol in Nawrozo Killi area of Nad Ali district, killing four soldiers in the process. Islamic Emirate of Afghanistan attacked and destroyed an Afghan National Army’s post in Narghal area of Arghistan district. Five elements of the Afghan National Army were killed and four wounded, while an element of the Islamic Emirate of Afghanistan was killed in the encounter.